The planets Mars or Mangal controls the muscular system of human body. It also rules over nose, forehead, and to some extend the circulatory system. When the planet Mars is afflicted in your birth chart it can cause problems like blood clot, brain fever, inflammation of the lungs, consumption, typhoid, and most of the diseases related to the blood. Under such circumstances apart from medication, one must recite the following Mangal Mantra, to propitiate the red planet. Kumaram shaktahastam ch manglam pranmamyaham"
Recite the following Mantra every day in the morning or on every Tuesday. Coral is the gem which represents the Mars. It is used to overcome evil impacts of the planet Mars. It makes you influential and ambitious. It brings physical stamina & energy. Helps you in controlling your temper. It ensures happiness and recovery from diseases like fever, cough bilious complaints, small pox, chicken pox, headache, loss of vitality,piles, boils & measles etc. In several cases astrologers recommend it for removing the problems of married life. 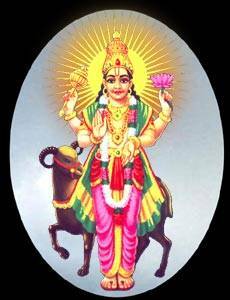 •Bhagavan is worshipped in the town of Vaideeswaran Koil which is also called Thirupullirukku Velur. Sambathi, Jadayu, Lord Muruga, Suriyan are also reputed to have worshipped in this sthalam. Even diseases that could not get cured by Mani Manthira Aushathangal got cured at this place and the presiding deity came to be called Vaidyanathar. His consort who was the chief of women of both worlds is hailed as Thayal Nayagi. Selva Muthukumarasami of this temple is lovingly called Muthiah. Kumaragurubarasami wrote the book "Muthukumarasami Pillai Thamizh". •Once, when Lord Shiva was in deep meditation, perspiration from his third eye fell on earth. The male child that was born of this sweat drop was Angaragan (Chevvai). Angaragan married Sakthi Devi of Avanti town and had a son called Sumarasan. Problems from wife/children/brothers, enimity with friends, loss of wealth, quarrels, problems with Govt., lasting poverty, anger, bad friendship, Kalathira Dosham are because of Chevvai. By praying to him, a person can offset the problems arising out of his afflictions. Brothers and sisters, physical strength, victory, valour are the beneficial aspects of this planet. 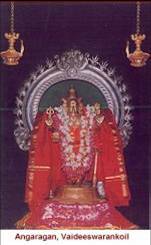 •The sthalam of Chevvai Bhagavan is Vaideeswaran koil, which is located 6kms from Sirgazhi en route to Mayavaram. His wives are Malini, Susilini. The presiding deity are Vaidyanathan and his consort Thaiyal Nayaki. Chevvai is the Lord of Mesha and Vrichika Rasi and he faces South direction. The Adi Devatha is Boomidevi; Prathyathi Devatha is Kshetra Balagan; his colour is red and his vahana is the ram. The grain associated with him is thuvarai; the flowers - shenbagam and red arali; fabric - red cloth; gem - coral; food- rice mixed with toor dhal powder. 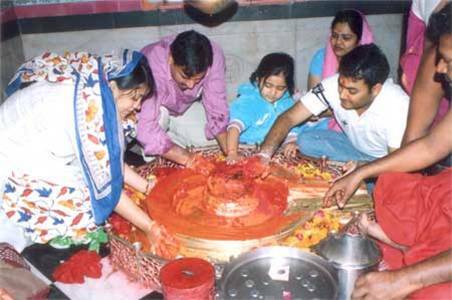 One of the most important factors in horoscope based matrimony is consideration of Mangal or Mangalik Dosha in the boy's or girl's kundli. Manglik Dosha means the planet Mars is posited in 1st, 2nd, 12th, 4th, 7th and 8th house in a horoscope. 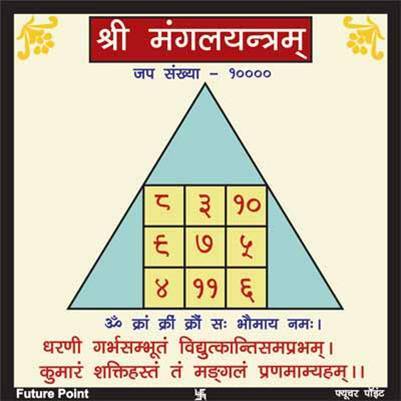 The most pessimistic of the interpretation is that the spouse of the person with Mangal dosha will wither die or suffer bad health .Placement of Mars in 6 houses out of 12 houses causes manglik dosha i.e. 50% chances to be a manglik. If a boy having Mangal dosha is married to a girl having Mangal dosha then the malefic affects are nullified leading to prosperity and a happy married life. 1) Start chanting the Hanuman Chalisa daily. 2)From the first Tuesday of a new month in a rising moon period Start a fast. 3)From a Tuesday start chanting the Sunder Kand from the Tulsi Ramcharitmanas for 40 days continuously. Success assured. All wishes will be fulfilled. 4)Daily chant the Gayatri Mantra for 108 times continuously daily. 5)Wear a blood red coralin gold in the ring finger of right hand while chanting the mantra OM KRAAM KREEM KROUM SAH BHOMAY NAMAH. Wear the red coral after getting your horoscope analyzed from a good astrologer. 6)Worship Lord Hanuman with the mantra:OM SHREEM HANUMATE NAMAH.Go to the Hanuman temple on Tuesday and offer sweets ,sindoor and light a ghee lamp. 7)Donate blood on a Tuesday every three months if health permits. 8)Donate red clothes to workers who work with sharp iron articles. 10)If Manglik Dosha is the cause of your not getting married then in that case do the fast as described above and along with it feed ants with wheat flour on that day. Success is sure. Mangalnath Mandir: According to Matsya puran, this is the birthplace of Mangalgraha or Mars. Flowing Shipra river presents a very beautiful view in front of the temple. Devotees gather in large numbers esp. on Tuesday. Located on a hillock, this place represents the highest place in the area. 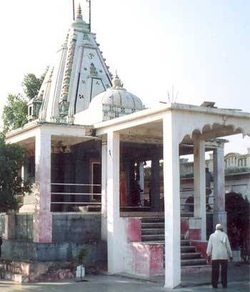 In ancient times, the place was famous as it is said to have provided a clear view of Mars – Ujjain was an important center for astronomical studies. This place, traditionally known for its suitability for astronomical readings of mars continues to hold its religious importance. Worship of Lord Shiva is offered at the temple. Karkarepha goes through the center of the Shivalinga at Mangalnath, it is centrally placed. 3..Gems- Red Coral, Cornolian •4..
Time - Near Mid day •5.. Following Mantra should be recited for it. Mantra: "Om Kraang Kreeng Kraung Sah Bhaumay Namah"
It should be worn on Tuesday.